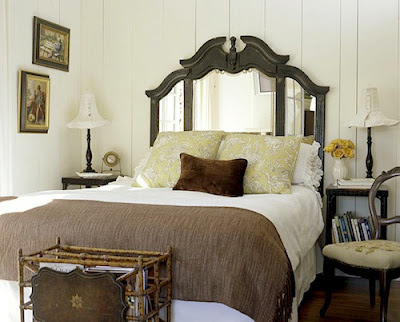 today, I am bringing to you some design ideas I've been stashing away for my mom's home. And even if you haven't seen her house, I promise you'll still get something out of them. Because design is universal, right? Let's start off with the bathroom. This is what I like to call a classic pretty. Simple, sweet and timeless. Half tiled wall, I love you. Hexagon tile floor, I love you too. This headboard used to be a dresser mirror. That is until someone unattached it, gave it a dark stain and placed it behind a bed. I, for one, think it was a fabulous idea. And since my mom has a dresser mirror identical to this, I think she should try it too. This eat in area is delightful in so many ways. 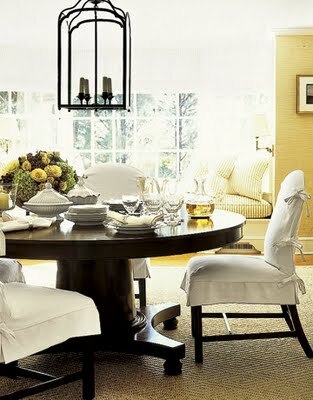 The round table, iron lantern, window seat, sisal rug, slipcovered chairs...I like it all. And this layout would just so happen to work perfectly in my mom's kitchen. I think this was another Better Homes and Gardens find. I think this setup would work well too and would be a great place for her to showcase her collection of bowls and dishes. Decisions, decisions. 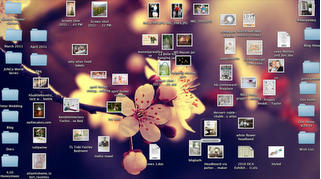 This one was saved more for the style and look than the actual layout. My mom's home is filled with a bunch of antiques passed down from my grandfather and great grandmother, so throwing in a contemporary kitchen just wouldn't fit. 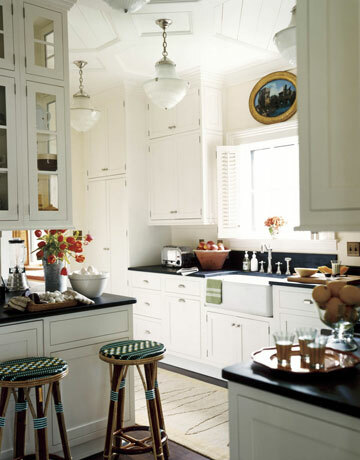 The dark wooden floors and contrast of the white wooden cabinets and dark countertops shown here would be perfect. 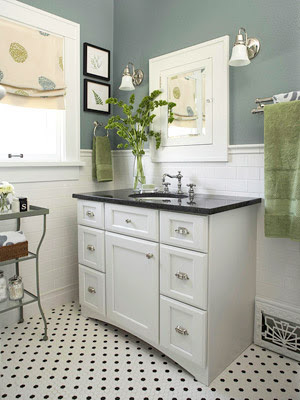 And nothing says traditional like a farmhouse sink. We could finish it off with a few light fixtures and perfectly placed oil paintings, and we'd be in business. Do any of you see designs and say "That would like great in so and so's home! "?